I know this is an older thread, but I felt the need to chime in with my opinion. I happened to discover this thread while doing a search for disability stickers. As someone who uses a wheelchair, I have to say that I agree about 99%. The reason I say 99% instead of 100% is because not all disabilities are visible. People with COPD and internal conditions that limit physical activity should be able to have that spot reserved. With that said, there should be varying degrees of disability that require a parking pass. Mental disabilities don't require you to park closer to your destinations. 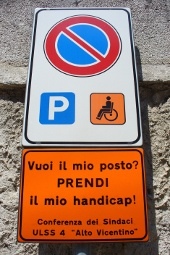 Perhaps a new sticker should be created for those with severe disabilities. Sure would help for me! It reads "You want my space? Then take my disability!" The reason I say 99% instead of 100% is because not all disabilities are visible.